F Kevin Undershute (Medicine Hat, Portland, 2004-08) has signed a one-year extension with Caen (France, Div 1). This season, in 24 games, he had four goals and a team-leading 16 assists. The Global TV outlet based in Kelowna chose to do a story this week on attendance at Kamloops Blazers’ home games. The story followed two home playoff games. In those games, the Blazers played host to the Kelowna Rockets, with 3,878 fans in the Sandman Centre on Tuesday night and 4,297 there on Wednesday. This season, the Blazers’ average attendance for 36 regular-season home games was 3,782. The Global piece was slugged: Where are the hockey fans in Kamloops? Interestingly, the only hockey person to try to answer that question was Bruce Hamilton, the governor, president and general manager of the Rockets, who also is the WHL’s chairman of the board. There wasn’t a comment from Stu MacGregor, the Blazers’ general manager who was at both home playoff games, nor was their a comment from Tom Gaglardi, the Blazers’ majority owner who attended Game 4. It was interesting, too, that Hamilton wasn’t asked: Where are the hockey fans in Kelowna? The Rockets averaged 6,082 fans per game in 2011-12, slipped to 5,358 in 2012-13, and haven’t been close to 6,000 since then. This season, they averaged 5,162 fans, down 80 from the previous season. The Global piece is right here. Mike McKenzie has been named general manager of the OHL’s Kitchener Rangers, effective immediately. He takes over from Murray Hiebert, who wanted a lighter workload and now is the director of hockey operations. . . . McKenzie, the son of TSN’s Bob McKenzie, has been with the Rangers since 2012. He was an assistant coach for three seasons, before adding assistant general manager to his job description in 2015. . . . The Rangers had their season end Friday night, with a 6-2 loss to the host Owen Sound Attack, which won the series, 4-1. Ryan McGill, a former WHL player and coach, is the Attack’s head coach. . . . In another OHL series, the host London Knights beat the Windsor Spitfires, 2-1. Windsor still leads that series, 3-2, and is going home for Game 6 on Sunday afternoon. The junior B Richmond Sockeyes of the Pacific Junior Hockey League have signed Steve Robinson as their new head coach. He replaces Judd Lambert, who stepped down earlier in the week after being head coach for nine of the past 10 seasons. . . . The Sockeyes finished their in their division this season, at 22-13-3-5. . . . This season, Robinson coached the midget A1 team in the Seafair Minor Hockey Association, which is in Richmond. winner of a series between the Everett Silvertips and Victoria Royals. If it’s the Silvertips, they’ll start in Everett on April 7 and 8. If it’s Victoria, the series would begin in Kent, Wash., with games on April 8 and 9. . . . Tri-City has lost 10 straight playoff games, going back to 2014. . . . If you’re looking for a series MVP, how about Seattle G Carl Stankowski. He got into seven regular-season games, but stepped up with G Rylan Toth unable to answer the playoff bell. Toth led all WHL goaltenders with 36 regular-season victories. . . . Stankowski, who stopped 28 saves last night, went 4-0, 2.00, .932 in the series. . . . F Alexander True (2) gave the Thunderbirds a 1-0 lead, on a PP, at 3:01 of the first period. . . . The Americans got even when F Kyle Olson (1) scored at 6:19. . . . F Nolan Volcan (2) put Seattle back out front at 19:59. . . . F Nolan Yaremko (1) got Tri-City even again, at 3:58. . . . Seattle F Donovan Neuls (3) broke the tie at 16:56. . . . Seattle got insurance from F Sami Moilanen (1) at 19:20 of the second. . . . True added an empty-netter at 18:33. . . . Seattle got two assists apiece from D Austin Strand, D Ethan Bear and F Keegan Kolesar, with Moilanen adding one. . . . Kolesar now leads the WHL’s playoff scoring race, with 11 points. . . . G Rylan Parenteau stopped 27 shots for the Americans. . . . Seattle was 1-3 on the PP; Tri-City was 0-3. . . . The Thunderbirds continue to be without F Mathew Barzal and G Rylan Toth, neither of whom has played since early March. As well, F Ryan Gropp missed his second straight game after taking a high hit from Tri-City D Dalton Yorke in Game 2. . . . Yorke sat out the second game of a two-game suspension last night. . . . Announced attendance: 3,020. Warriors. . . . The Broncos lead the series, 3-2, and get their first chance to wrap it up tonight in Swift Current. A seventh game, if needed, would be played Monday in Moose Jaw. . . . The Broncos also got a huge night from G Jordan Papirny, who finished with 34 saves. 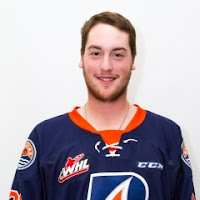 The Warriors had a 16-9 edge in second-period shots and it was 10-1 in the third. . . . Pederson scored his first two goals of the series in the second period, at 3:25 and 14:03. . . . Moose Jaw got its goal from F Brett Howden (2), on a PP, at 17:22 of the second period. . . . G Zach Sawchenko stopped 20 shots for Moose Jaw. . . . The Warriors were 1-6 on the PP; the Broncos were 0-2. . . . The Warriors had F Jayden Halbgewachs and F Noah Gregor in the lineup, both of them surfacing after head coach Tim Hunter threw them under the bus following Game 4. Hunter had threatened to scratch both players from the lineup, but didn’t. Perhaps their combined 161 points, including 77 goals, in the regular season had something to do with it. . . . Halbgewachs has a goal and two assists in this series, while Gregor is pointless. . . . 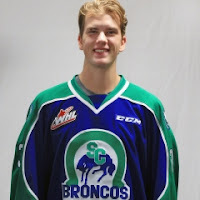 The Broncos had D Noah King, 17, in the lineup for the first time since Nov. 4. They scratched D Dom Schmiemann. . . . Announced attendance: 4,465. I asked Blazers HC Don Hay to give me his cliche' heading into game five - an elimination game. "One die all die". 6 on Sunday. A seventh game, if needed, would be played in Kelowna on Tuesday. . . . The Blazers won Game 3, 4-1, at home on Tuesday, then dropped a 1-0 decision on Wednesday. . . . After five games, Ingram is 2-3, 2.01, .951. . . . Ingram, who turned 20 on Friday, has played in 12 playoff games, all against the Rockets. He is 5-7, 2.98, .944. . . . F Reid Gardner (2) gave the Rockets a 1-0 lead at 11:05 of the first period, meaning this was the first time in the series that the team scoring first didn’t win. . . . F Garrett Pilon, who signed a three-year entry level contract with the NHL’s Washington Capitals on Thursday, pulled the Blazers even with his first goal at 17:46. . . . Pilon also drew an assist on a goal from F Quinn Benjafield (2) at 1:22 of the second period that gave Kamloops the lead. . . . The visitors put it away with third-period goals from F Rudolfs Balcers (2), at 5:32, and F Collin Shirley (1), shorthanded, at 12:22. . . . Kelowna had been the only one of the CHL’s 60 teams not have allowed a shorthanded goal this season. . . . Benjafield added an assist to his goal. . . . The Blazers got 15 saves from Ingram in the second period and 10 more in the third. . . . The Rockets were 0-4 on the PP. . . . The Blazers were 0-8 on the PP; they now are 1-28 in the series. . . . The Blazers had F Luc Smith in their lineup for the first time in this series and he picked up an assist. Smith had suffered an undisclosed injury late in the regular season. . . . Jon Keen, the radio voice of the Blazers, didn’t make the trip, so missed his second straight game after showing symptoms of mumps. He isn’t expected to return for Sunday’s game, but hopes to be back if there is a Game 7. . . . The Rockets chose not to make head coach Jason Smith or players available for post-game interviews, according to Larry Fisher of the Kelowna Daily Courier, “due to fear of the mumps.” Post-game quotes from head coach Jason Smith were made available via Kevin Bain, Kelowna’s media relations manager. . . . Announced attendance: 5,547. Victoria Royals. . . . The Silvertips lead the series, 3-2, with Game 6 in Victoria on Sunday afternoon. . . . Everett got the game’s first goal with F Matt Fonteyne (2) scoring at 5:14 of the second period. . . . Victoria tied it 48 seconds later when F Carter Folk scored his first goal. . . . 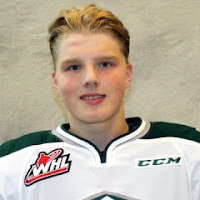 The Silvertips went back out front when F Patrick Bajkov got his fifth goal, on a PP, at 19:59. . . . Victoria F Jared Dmytriw (1) forced OT with a goal at 14:20 of the third period. . . . Tuulola won it with his second goal of the series. . . . The Silvertips got two assists from each of D Kevin Davis and F Dominic Zwerger, with Bajkov and Fonteyne adding one each. . . . Bajkov and Zwerger, who has eight assists, now have 10 points apiece, one point off the playoff scoring lead. . . . G Carter Hart stopped 17 shots for the Silvertips. . . . At the other end, Griffen Outhouse blocked 33 shots. . . . Everett was 1-3 on the PP; Victoria was 0-1. . . . 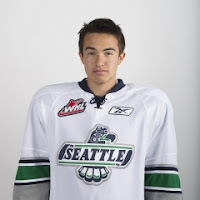 The Silvertips welcomed F Riley Sutter back to their lineup, but they remain without F Devon Skoleski. . . . The Royals continue to be without F Jack Walker and D Scott Walford. . . . Announced attendance: 3,833.